Oats are a healthy, filling and nutritious food. The gentle power grain contains a balanced ratio of carbohydrates, protein and good quality fats. The fibers of oats pamper even the most delicate stomachs. Oats provide essential vitamins and minerals for general wellbeing, as well as a whole host of other beneficial ingredients, such as antioxidants, phytoestrogens, and plant sterols. Oats contain a great deal of proteins, compared to many other grains. Oat flakes have a protein content of about 14 and about 16% in bran. Oat protein is nutritionally of high quality. It is well absorbed, over 90%, for use by the body. The proteins consist of amino acids. Part of them are so-called essential amino acids, which are recommended in the daily diet. Other amino acids can be formed by the body itself. The amino acid composition of oats is diverse, but the levels of essential amino acids lysine, methionine and threonine are low. When a diet is diverse, the intake of essential amino acids is usually not a problem. Oats do not contain gluten, unlike rye, wheat and barley. Gluten is the grain protein that those with celiac disease must avoid in their diet. A celiac can safely use gluten-free oat products, the purity of which is guaranteed from the field to the packing. In practice, the purity means that no other cereal containing gluten has been mixed into the oats at any stage of production and manufacture. This information can be found on the product label. Oat grains contain 3 to 18 percent fat, depending on the variety. Most of the fat is unsaturated or soft fat that is beneficial for one’s health. The fat content of oat bran and flakes is about seven percent. More than 2/3 of it is unsaturated fat. The fat composition of oats is therefore excellent for nutrition. According to nutritional recommendations, more than 2/3 of edible fat should be unsaturated, soft fat, whereas the saturated, hard fat content should not exceed 1/3. Excess fat in a diet is a risk factor to cardiovascular health. The soft fats in oats also provide the body with linoleic and alpha-linolenic acids, the sufficient intake of which is highly necessary for health. These fatty acids cannot be formed by the body itself, so they must be regularly taken through food. The best sources of linoleic and alpha-linolenic acid in a diet are vegetable oils, nuts and seeds. Beta-glucan helps to control blood cholesterol levels and normalizes increased blood sugar levels after meals. Beta-glucan has a special ability to form a gel with water in the intestines, which prevents cholesterol in food from being absorbed into the body. The gel also binds bile acids containing cholesterol in the intestine. Therefore, beta-glucan helps in the control of blood cholesterol levels. This effect occurs when 3 grams of beta-glucan is consumed from food every day. For example, it can be obtained by eating two plates of oatmeal porridge or by mixing half a decilitre of oat bran in yogurt or a smoothie. 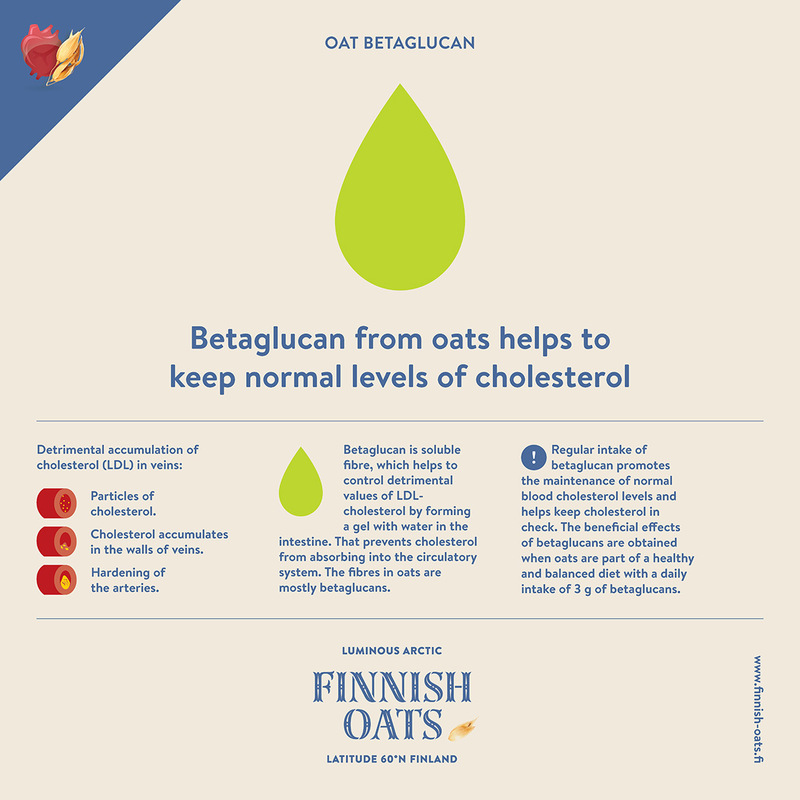 Beta-Glucan is also useful in controlling blood sugar levels, as fibre-rich oat products help to offset rises in blood sugar levels after meals. Carbohydrates that fast raise and lower blood sugar levels are, for example, found in low-fibre bread and products with a high sugar content. Beta-glucan in oats and other cereal fibres, on the other hand, are slow carbohydrates that help offset fluctuations in blood sugar levels.